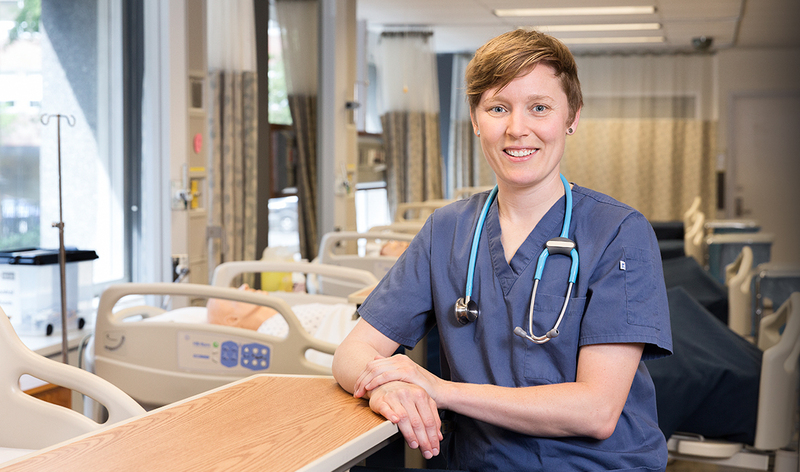 The Lawrence S. Bloomberg Faculty of Nursing is Canada’s premier nursing school, and a principal factor is the faculty’s emphasis on experiential learning, where the cutting-edge Simulation Lab plays a major role. Bloomberg Nursing’s state-of-the-art Simulation Lab allows students to treat patients, work in teams, evaluate patient histories, identify and assess risks, make diagnostic and therapeutic decisions, delegate tasks, and communicate effectively with patients and family members—all in a high-pressure environment. “The most important thing about the Sim Lab is that it just creates a level of realism that you can’t find from just reading a textbook or doing an assignment,” notes Alice Heisey, a pediatric nurse at SickKids Hospital who has also taught at the Sim Lab. This creative realism includes an advanced patient simulator, SimMan 3G, generously donated by the James H. Cummings Foundation. SimMan 3G is designed to deliver the most realistic training possible to every Bloomberg Nursing student who practices in the Sim Lab. The Simulation Lab is a critical component of the world-leading education provided at Bloomberg Nursing, and a direct result of the legacy of Lawrence and Frances Bloomberg’s $10-million donation to U of T’s Faculty of Nursing in 2007. This generous gift has helped advance the science and scholarship that underpin nursing education locally, nationally and globally.